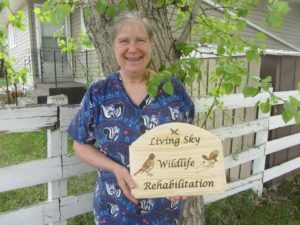 Living Sky Wildlife Rehabilitation was created to formalize the work that Jan Shadick had been doing for several years. She took in 20 animals in 2005. This has grown consistently every year to our current total of 484 animals in 2014. Costs continue to grow each year as we receive more and more animals in need….Thank goodness we moved to a separate facility in 2016 when we took in over 650 animals. Since the move, our services have been in demand, with 950 injured and orphaned animals arriving in 2017 and over 1160 in 2018. Our budget has grown to over $100,000, with less than $2000 of that going towards Administrative costs. We continue to operate primarily with volunteers, except in the summer when we hire summer students, using government grants and donations to fund their salaries during the busiest season. We need your help to continue to provide the level of care and attention that these animals require to grow and thrive upon their release back to their natural habitat. Please consider a donation today. Receipts provided for donations over $10. We provide the full range of treatment services needed to rehabilitate small birds and mammals. We assist the public with issues relating to wildlife; and promote knowledge and appreciation of wild animals and the habitats they depend on for survival. Animals outside the scope of LSWR will be accepted, assessed, stabilized and transferred to the appropriate rehabilitation facility. Animals are fed specially formulated diets to meet their nutritional needs and provided with the necessary medical care to heal their injuries. All animals are carefully handled to maintain their fear of humans so they can be released back to the wild. I was born in California, then moved to Connecticut following University, and finally came to Canada in 2001, after 14 years in Connecticut. I discovered Wildlife Rehabilitation in Connecticut and became a licensed wildlife rehabilitator, working with small mammals and small birds. I have taken several courses from the IWRC; attended conferences; passed the CT state exam; mentored and been mentored on work with specific species. My learning continues with every new season, and each animal that comes into care.